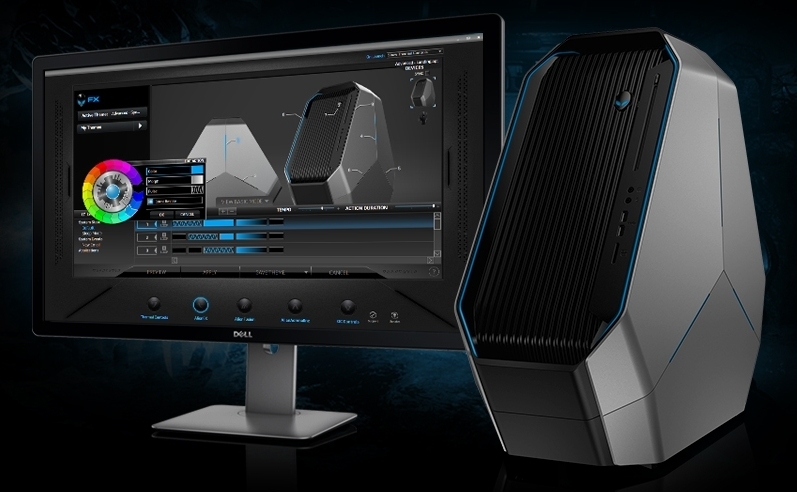 Alienware's new Area 51 gaming PC is making a comeback. If you through the design of the original system was revolutionary way back in 2006, wait until you get a load of what they've come up with this time. I promise you, it's unlike anything you've seen before... and it's actually functional. The chassis has been completely redesigned, now with a triangular / hexagonal body - or as Alienware calls it, a "triad case." It puts cooling efficiency and ergonomics above all else as it's designed to properly vent warm air even when backed up against a wall. When sitting flat, the sloped front bezel makes accessing USB ports and the like a breeze. Reaching the rear I/O panel is an easy affair as well: simply tilt the system forward on its front edge. Alienware has even included some LEDs to help light up the rear panel while fiddling with it under your desk (finally, a purpose for LED lighting). The system also has built-in handles on each corner to help with transportation although at a height of 22 inches and weighing in at 45 pounds, it probably still won't be all that easy to haul to the next LAN party (do people still host LANs?). Even with the odd shape, there's still plenty of room inside for hardware. Good thing, too, because Alienware is packing the new Area 51 with Intel's brand new Haswell-E chips and supporting hardware. Buyers can configure their system with up to 32GB of DDR4 RAM, multiple hard drives / solid state drives and even a 1,500 watt power supply.